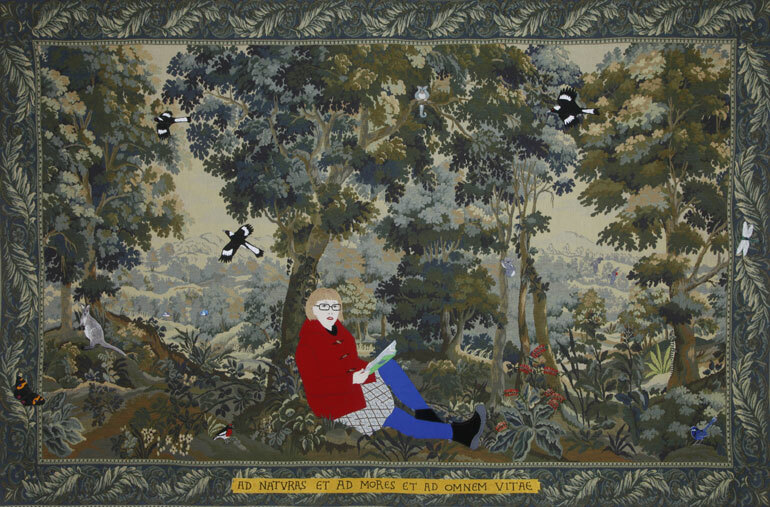 Inspired by The lady and the unicorn tapestry series, an Australian artist in Paris created unique tapestry works featuring Australian animals in European landscapes. In 2007 Adrienne Doig was artist-in-residence at the Art Gallery of NSW’s Moya Dyring Studio at the Cité Internationale, Paris. During this time she was a regular visitor to the Musée de Cluny, home to the French medieval masterpiece known as The lady and the unicorn tapestry series. Created around 1500, these six tapestries have been the source of inspiration for many writers and artists, including for Doig. Using European tapestry landscapes as a ground, Doig colonised them with Australian animals: wallabies and wombats, Tasmanian devils and kookaburras. Two of these works, on loan to the Gallery, are currently on display in the research library and archive to coincide with the exhibition of The lady and the unicorn tapestries at the Art Gallery of NSW. Presented alongside are Doig’s Musée de Cluny sketchbooks, gouaches and tapestry working ideas, which form part of the artist’s archive held by the Gallery.